Watermark is a text or an image, positioned behind document content. Usually it contains information, identifying document author. You can specify size, font, style, color, page position, number of pages to display watermarks etc. An image from PDF file can also be used as watermark. Different watermarks may be used in single file, and every page can have multiple watermarks. Watermark settings may be saved for later use. To add watermarks to PDF document use Document > Watermark > Add menu item. Saved setting List of saved watermark templates. To add a template, set required watermark parameters and press Save. Specify title for the template in a pop up window. To remove template, choose it in the list of saved settings and press Delete. File If this option is checked, then an image loaded from PDF or image file will be used as source for watermark. Browse — Choose source PDF or image file for watermark. Zoom — Scale of the watermark to source image from PDF file. To make this option active, remove Appearance>Scale relative to target page mark. Source Choose source for watermark. It can be text or image. Text If this option is checked, then inserted text will be source material for watermark. Font — Here you can set options for the font of the watermark text: font family, size, color underlining. Scale relative to target page — Watermark scale relatively to the page it will be inserted on. Position Set watermark position on the document page. Vertical Distance — Value for vertical watermark offset relative to selected position: Top, Center or Bottom. Horizontal Distance — Value for horizontal watermark offset relative to selected position: Top, Center or Bottom. 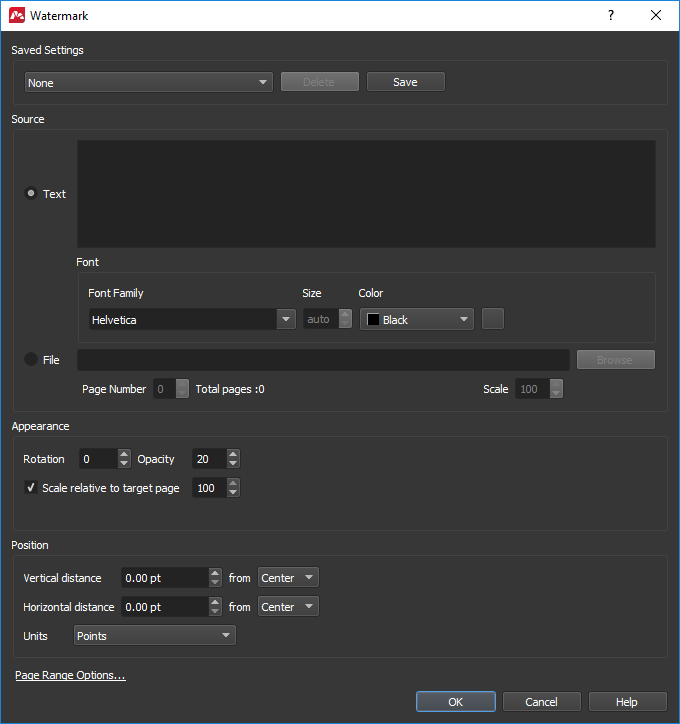 Pages Range Options number of pages to add watermarks. To remove watermarks use Document > Watermark > Delete. All the watermarks in the document will be removed.